Chiu’s model is of interest to me because if it is correct, procrastination is a function of perceived ability – therefore, procrastination can be caused by low self-esteem. Please note that “Flow” in this case refers specifically to the mental state proposed by psychologist Mihaly Csikszentmihalyi. 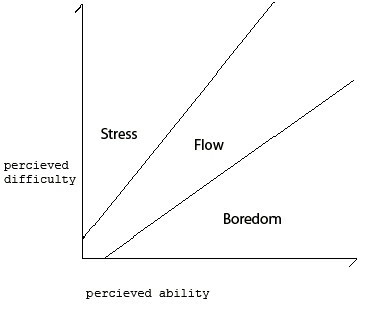 “Flow” corresponds with the idea of “being in the zone”, and perhaps with “no-mind” in Zen. Chiu suggests that “solving procrastination” involves ordering tasks according to perceived difficulty, then starting at the bottom and working up. I would suggest that anything that reduces self-absorption, even if it is not immediately useful, will increase one’s perceived ability. For instance, someone who meditates regularly is likely to feel confident as an effect of being less anxious and self-centred. Therefore they are less likely to procrastinate because of not feeling up to a particular task.